There are plenty of great looking, functional, and affordable women’s exercise and running shoes on the market; choosing the best one in terms of both style and comfort can sometimes seem a bit overwhelming! It can become even more confusing when the different functions of each type of athletic shoe are taken into consideration. Targeting exactly what activities your exercise routine will consist of, be it running, aerobics, hiking or biking, can help determine which shoe will be best for your specific needs. So which shoes are a cut above the rest in style, function and comfort? For runners, it doesn’t get much better than Nike shoes, which features a new footwear technology that can compensate for over-extended stride or poor foot balance. This technology, called the Independent Flywire system, will also modify shoe support and shape for each foot during a jog, meaning more support for the arch, heel and ankle. With the jogging trend becoming increasingly popular as more people look to cut down driving costs and reduce insurance premiums, it’s essential to find a shoe that can provide the best possible support for your body frame, foot shape and running style; the Nike LunarElite +2 does exactly that while looking great. It has a sleek design that available in gradient burgundy and gray or in royal blue and white. For ladies that enjoy cross country hikes or power walking, New Balance shoes offer a model of shoe that’s both functional, ruggedly stylish and comfortable. The New Balance 967 provides optimal support for prolonged hikes and walking workouts. The full grain, dark brown leather provides beautiful, rich looks that makes this a classy and cute shoe without being overly girly or flashy. Superb construction and high quality attention to detail also means this shoe will last much longer than types using synthetic leather substitutes. The ASICS GEL-170 TR is a great all around athletic shoe that looks great, feels great and is entirely suitable for a number of workouts and sports, including tennis, running and walking. With extra support and arch padding for increased foot stability, the GEL-170 TR is a shoe that can be worn all day in complete comfort. The GEL heel system allows for greater impact absorption and less stress on the ankle, heel and arch, meaning less foot and calf muscle fatigue after long workouts. The ASICS GEL-170 TR is available in three tones; white with pink and charcoal trim, white with navy blue and light blue trim, and white with blue and silver trim. It has a low, sleek profile and attractive shape that will look great with a variety of workout outfits and colors. 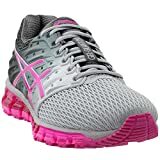 Always be sure to choose the proper size Asics shoes for maximum support and comfort, and never go with poorly made shoes to save money; high quality exercise shoes will last longer, reduce the chance of foot, ankle and leg injury due to proper support systems, and usually look and feel better overall. Can’t afford athletic shoes? Buy shoes now, pay later.